A wonderful hand crafted period pendant light bar, with a polished nickel plated solid brass full length ceiling mount and braided silk flex. Three polished nickel shades are supspended in a row, with a large upper gallery and small station lamp brimmed shades, supplied complete with period style Tesla globe lamp bulbs as shown. 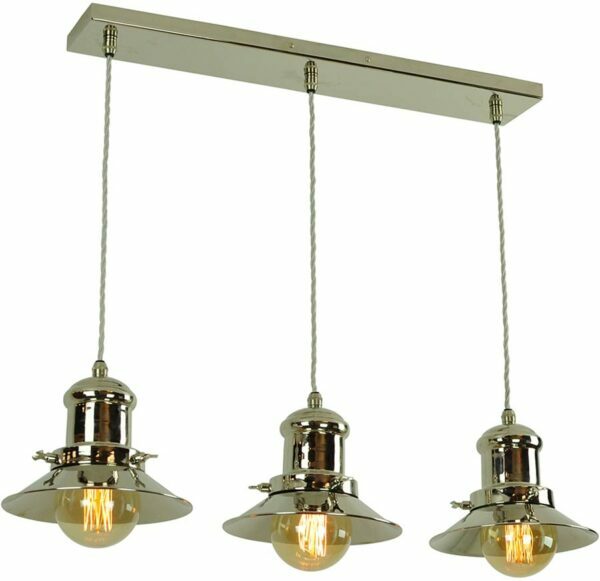 Completely hand crafted, wired, nickel plated and finished in Sussex, this light fitting shows off British craftsmanship at its best.